There are 12-15 million cases of head lice reported each year in the U.S. and I have yet to know any school of young children that hasn’t had a child or two that gets lice during a school year. Lice infest children more than adults because kids have more head to head contact at that age. Lice are mostly spread through head to head contact. They can also be transmitted by sharing personal items such as hats, helmets, brushes, combs, hair ties, towels and head phones. They do not fly or jump but they can survive off the human head for up to 36 hours on bedding, clothing, backpacks etc. Lice can also survive in water. Lice are not dangerous and don’t spread disease, but they are contagious and bothersome. Their bites can cause a child’s scalp to become itchy and irritated. Unless treated, persistent scratching can cause infection. What’s confusing to many parents and caregivers who haven’t dealt with lice previously is that lice prefer clean scalps and hair. A child with lice isn’t dirty, they are clean. Fairy Tales Rosemary Repel Natural Lice Prevention Shampoo uses organic rosemary, citronella, tea tree, anise, lavender and geranium oils proven safe, gentle and effective to help repel lice. There are no pesticides, harsh chemicals or toxins and is formulated without dairy, nut oil, soy and gluten. It is clinically proven 95% effective to repel lice and great for every hair type. Fairy Tales Rosemary Repel Creme Conditioner contains natural cherry bark and passion flower to moisturize, condition and detangle. The conditioner is blended with organic rosemary, citronella, geranium and tea tree oils and is proven safe, gentle and effective to help repel lice. It has a blend of vitamins and minerals that hydrate, soften and nourish any hair type. The conditioner manages and eliminates tangles without residue or build-up. Like the shampoo, the conditioner does not contain dairy, nut oil, soy and gluten. Fairy Tales Lice Good-Bye is clinically proven to kill lice and their eggs naturally and effectively without harsh chemicals or pesticides. Lice Good-Bye is the only natural treatment proven effective to kill lice, “super lice” that are resistant to harsh chemical removal treatments, and their eggs. Lice Good-Bye is safe for repeated use during and outbreak and head checks. Each bottle includes six to 10 treatments (depending on hair texture and length). 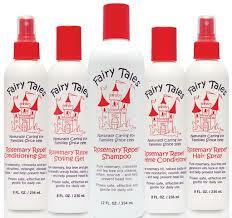 You can purchase your own Fairy Tales lice products by clicking links above or below. Don’t forget to stop by next Sunday for another product review.